(15/P26) TRENTON – More than 200 volunteers will be taking part in the planting of dune grass at Island Beach State Park this Saturday, March 21, as part of an annual effort to help protect the important dune system while enhancing the natural beauty of one of the state’s most popular parks. 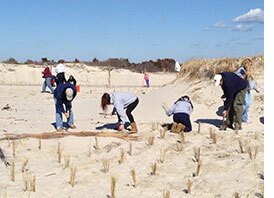 Volunteers from AmeriCorps, the Barnegat Bay Partnership, and the Friends of Island Beach State Park will plant 15,000 dune grass plants on the dunes at Ocean Bathing Area 1, the most popular and visible area at the Ocean County park. In addition, dozens of volunteers from the Ocean County Vocational School MATES Academy will be placing 4,000 plants in the area of the Ocean House. Nearly 10 miles long, Island Beach State Park preserves one of the last stretches of undeveloped Atlantic barrier island ecosystem in the region. More than a million people visit the park each year. American beach grass is a leafy grass that grows in bunches, reaching heights of two to three feet. The spike-like seed head is about ten inches long and appears in late July or August. Leaves are long and narrow. One outstanding growth characteristic is the strong underground rhizomes that spread beneath the sand and give rise to many new plants. The species’ vigorous growth enables the plant to withstand heavy deposits of sand and the harsh ocean environment. Many visitors to the park will get to enjoy this season’s plantings, as they are adjacent to a main parking area and the main walkway to the park’s most popular bathing beach. Media notes: Planting is scheduled to begin around 9 a.m. and conclude around noon. The event may be postponed in the event of inclement weather. Contact the park office at (732) 793-0506.